Chennai, 21st December 2018: Home chefs in every household across all regions face one common question everyday; ‘what food should I prepare’. As one of the most loved brand in the country, Big Bazaar solves this problem by introducing India’s first LIVE ‘cook along’ channel with Youtube. 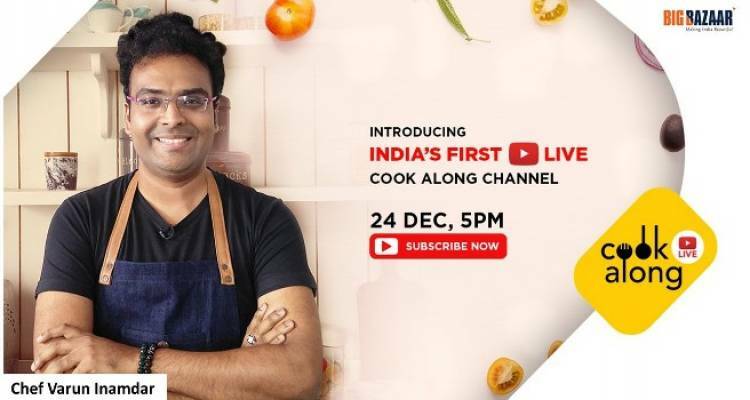 Big Bazaar’s ‘cook along’ will be first of its kind platform where all home chefs and food lovers can watch and cook new dishes at the same time every single day, starting on 5pm on 24th December on Big Bazaar Youtube Channel. Adding some masaledar tadka, these dishes will be prepared by some of the finest celebrity chefs in the country. Through Big Bazaar’s ‘cook along’ home chefs can directly interact with the chefs as they prepare the dishes. The chefs will answer all their questions, clarify all their doubts and share tips that will help them easily master restaurant style cooking. ‘Cook along’ will also demonstrate recipes themed on special occasions and festivals to help all Indian homes participates in the festivities. Further easing out the cooking process, Big Bazaar’s ‘cook along’ will soon introduce ‘Recipe Kits’ of the dishes that will be prepared the next day. These recipe kits will include all the ingredients that are needed to prepare the dish. Recipe kits will also be available at the nearest Big Bazaar store for the convenience of the consumers. Apart from this, Big Bazaar will also launch LIVE cookery studio where customers can witness LIVE demo by local chefs and also participate everyday.